Trude Guermonprez began experimenting with what she called “textile graphics” around 1970; she described this evolution in her work as moving toward: “More [of] an awareness of our ties with the universe…I sense a quieting of passions in our lives which gives strength and freedom from anxieties.”[i] This hanging, entitled Warp Face, is representative of Guermonprez’s later, painterly works, which are imbued with a personal, poetic intimacy and sense of quiet reflection. The face, which is painted on the warp before weaving, becomes ghostly as it is interrupted by the passage of the weft. Guermonprez was born in Danzig and studied weaving at the School of Fine and Applied Arts in Halle-Saale, under the tutelage of Bauhaus-trained artist Benita Otte. 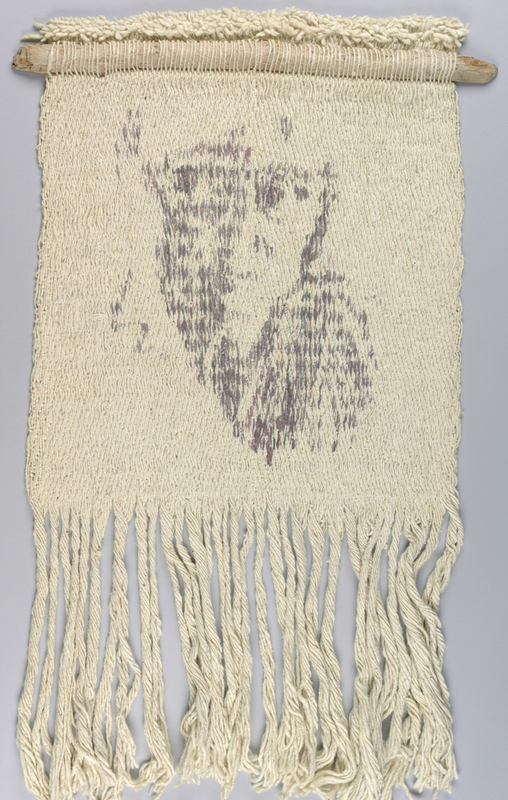 She came to the United States in 1933 to teach weaving at the experimental Black Mountain College. She then moved westward and taught weaving at the Pond Farm Workshops in Guerneville, California alongside the Bauhaus ceramicist Marguerite Wildenhain. In 1960 Guermonprez was named Chair of the Crafts Department at the California College of Arts and Crafts, where she remained until her death in 1976. Jacqueline Sullivan is a graduate of the Master’s Program in the History of Design and Curatorial Studies at Cooper Hewitt, Smithsonian Design Museum. [i] Oakland Museum of Art, The Tapestries of Trude Guermonprez, Introduction by Hazel V. Bray (Oakland, CA: Oakland Museum, of Art: 1982), 19.